An inanimate start to the day when the much loved though undermaintained Boardman seized up on me at the end of the road. Bloomin' back brake wouldnae budge. Dragged it like a reluctant dachsund to Cyclelife. Ooh, your caliper's corroded, squire. Best get that fixed under warranty at Herr Halford's. They unbudged it -- I'd advise you not to use that rear brake -- and sent me on my way. Phew, got wheels for today's lunchtime rendezvous. Freewheeled round the back of the Co-op -- oops, Vergo -- emerging on to The Wash, aka Upper Orwell Street, a throughfare as well cared for as my bike. Yes, we're in the burgeoning (must look that up) Mint Quarter. 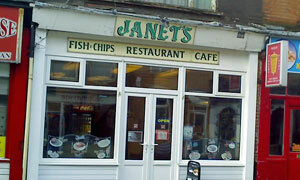 Here, opposite the Koh-I-Noor, squashed between Fresh Kebabs and the City Grill, with its lovely fairgroundy spearmint green signage above a pure white PVC frontage, lies Janet's. Here come the girls -- well, one of 'em -- after the masculine possessively named Al's, Jack's and Kenny's. Wooden furniture, mirror on the wall, no pictures, large chalkboard listing plentiful options. Not my mother's son for nothing and those greengrocer's apostrophes leap out, notably dinner's and breakfast's. Grenvyle got no further than the top leftmost item, the all day breakfast. Not quite up to that, so mine's the humbler less bellybusting English breakfast. Couple of newspapers (Sun, EADT) on the counter, where you order -- fried slice or toast? -- er, good to have the choice, and a pleasant change not to be paying upfront too. Local radio is unobtrusively playing and the fruit machine is punter-free. Here's a pile of buttered toast for me and Rene to fight over, plus assortments of double egg, bacon, beans, et cetera, unassumedly delivered by the main man. He doesn't say much but managed to give the impression that nothing was too much trouble. Much satisfied scoffing ensues. Small range of hot pudds on the big board: this is Janet's, not Berridges. Four letters suffice: c-a-k-e, presented in clingfilm. Can't go wrong with a piece of sponge, and I've had worse cups of coffee too. Bloke says this place has been here for 11 and a half years. He's clearly the man who began it, Janet. If it was a car -- Minivan. If they were passing by -- Adam Woodyatt.